IRON Networks converged system products simplify Microsoft infrastructure deployments by integrating Microsoft’s new software defined datacenter software (SDDC), “The Cloud OS” and industry-standard network, compute and storage hardware; all integrated and supported as a single optimized turnkey configuration SKU. IRON offers enterprise and service provider class system platform designs that integrates all of the Microsoft modern datacenter technologies into a single model that abstracts all the complexity and brings together networking, server, storage, virtualization, automation, flexibility and scalability into a single converged cloud platform; all of it coupled with simplified deployment and serviceability services offerings. This creates a highly optimized cloud infrastructure solution that is complete, simple to acquire and deploy. IronPOD™ Turnkey 200 System is a 24U self-contained converged Infrastructure-in-a-Box; it is available as a pre-configured single rack IaaS POD. IronPOD™ Turnkey 200 Systems built-in hardware and software redundancy provides highly available and resilient operations that helps creates end-end office IT infrastructure platform capable of scaling to hundreeds of VMs. This creates a simple, custom infrastructure solution that reduces the complexity, risk and cost of implementing and supporting private or hybrid cloud for branch offices and small businesses. 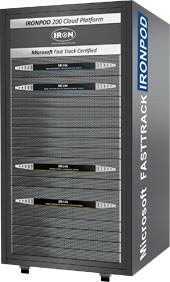 IronPOD Turnkey IaaS Systems, Cost-effective Microsoft FastTrack Certified Platforms. IronPOD 200 Systems are built using standardized hardware building blocks and Microsoft Windows powered network, compute and storage virtualization technologies. Everything you need is provided in one single SKU package, including Microsoft Windows Server 2012 and Microsoft Windows System Center Manager Software. It is delivered ready-to-run pre-validated, pre-tested, pre-cabled, pre-racked to help you accelerate your custom private cloud or specific business application configurations deployment in as little as 30 days from your order. 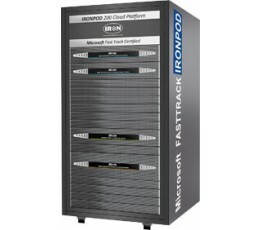 IronPOD 200 systems are Microsoft FastTrack certified and available via qualified partners to help you standardize, optimize and accelerate your time to value without extensive design and configuration cycles that require specialized IT skills. IronPOD™ Systems are custom configured using IRON designed and Microsoft FastTrack validated networking, compute and storage virtualization building block. IronPOD building blocks enhance core capabilities of the Windows Server operating & storage system, Hyper-V technology, and Microsoft System Center to deliver a turnkey, highly optimized solution platform. Network Fabric Switching: End-to-End Converged networking architecture that helps reduce data center costs by using a common low latency 40/56GbE infrastructure for compute and storage with iWarp and RRoCE support. Supports 2 12 ports 40/56GbE QSFP Network Switches + 24 RJ45 ports rack management switch. Network Fabric Management Head (MSC) Express: Microsoft System Center management head with Network Virtualization Gateway support on customizable industry-standard dedicated dual-node clustered HA appliance hardware. Compute Server Block (HVCB): Microsoft Windows Hyper-V technology on customizable industry-standard hardware with NVGRE offload support. Supports 8 Compute Nodes (2x HVCB Compute Blocks) per Rack. Storage System Block Cluster (WSSB): Microsoft Windows Storage SMB3.0 Server, highly scalable Scale-Out File Storage (SOFS) NAS technology on customizable, high performance industry-standard appliance hardware. Includes, single 24 disks WSSB storage block per rack. Storage Controller Heads: Single WSA-200 Series Storage Controller Head, powered by Microsoft Windows Unified Storage Server. Storage JBOD Filers: external direct attached enclosure (DAE) arrays; 24 HDD/SSD disks auto-tiering per WSSB Storage block Cluster support. Installation and Support Services are included. Our highly experienced and expertly trained sales professionals and partners deliver a converged infrastructure precisely the way you need it. IRON also offers a variety of services and tools to help our customers get started with confidence and their own pace. Onsite installation and implementation is included with every IronPOD 200 deployment, complete with an orientation training session and configuration support. Iron support provides the foundation for secure and reliable high-availability infrastructures with enhanced hardware support and software technical support for problem resolution. The IronPOD Infrastructure family of solutions demonstrates how open and flexible architectures powered by core Microsoft Windows technologies combined with IRON Services create practical, innovative solutions designed to reduce complexity and costs while improving productivity. IRON Services can help deliver elastic IT, whether you are building a platform for private cloud computing or for better availability and management of applications.